Icelandic Noir is a relatively new phenomenon on the literary stage, but the style has definitely found its place in readers’ hearts around the world. For those new to this subgenre of crime fiction, Icelandic Noir marries American Neo-Western—small towns and wide-open spaces—and Nordic Noir, famous for dark atmosphere and police perspective. 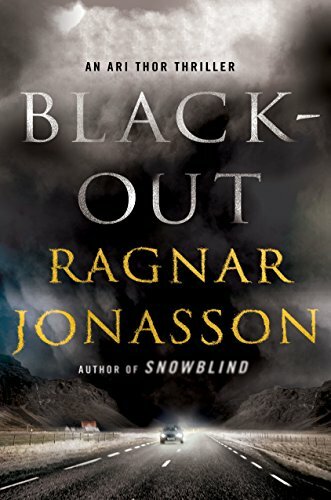 One of the names firmly entrenched in the genre is Ragnar Jonasson, author of Blackout, the third in his Dark Iceland series. The occasional murder does happen, however, but the surprise of a murder in a small peaceful community adds to the tension. As with much Nordic Noir, Ragnar’s series follows a police officer, the young and inexperienced Ari Thor. Though the multiple points of view keep the reader at an emotional distance from any specific character, it also puts the reader in the voyeuristic position of viewing the complex story from every angle. This does not mean, however, the characters don’t feel layered and nuanced. Like his hero Agatha Christie, Ragnar creates fully developed characters with just a few lines. “He was much too young for her, of course, although she refused to rule anything out. He was a serious character, with dead eyes, she decided, as if he had lost something precious.” Ragnar’s attention to human psychology shows us something intimate about both the older woman musing on a younger man, and the younger man himself. Blackout does not move at the breakneck speed of a thriller, nor does it view the world solely through the eyes of a detective, as one might expect from a police procedural. What it does do, is jump the reader from character to character, each providing a piece of the puzzle. The fun of the novel lies in tracking all those pieces, and trying to solve the crime before all the pieces have been fit together. The novel ends with a plot twist most readers won’t see coming, despite all the clues dropped along the way. A deeply satisfying read, Blackout may be some readers’ first introduction to Icelandic Noir, but it will not be the last. Blackout will leave you hungry for more.